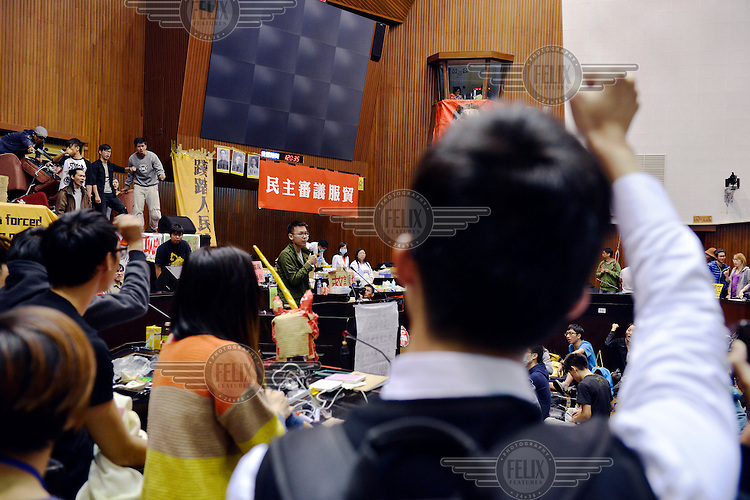 Student leader Lin Fei-Fan (centre) addresses the amassed students and some of the local press inside Taiwan's Legislative Yuan (Parliament) Building on the 4th day of its occupation by students in opposition to the passing of the Cross-Straight Service and Trade Agreement between Taiwan and China. The students, and many normal Taiwanese, fear the erosion of their hard-won democracy and, eventually, independence, making them, in the words of one student protestor 'no better off than Hong Kong'. Ma ying-jeoh bears the brunt of the protestors ire; known as "Ma 9%" after his latest approval rating, he is seen as kowtowing to the demands of China and selling out Taiwan.